I am a huge fan of longboarding. It is a rewarding activity that will provide you with cardio workouts, will help you stay slim, will help you remain flexible, and will allow you to travel from one place to another much faster than just walking would. If you are considering this sport you should also note that longboarding does not require a lot of expensive equipment in order for you to get started. 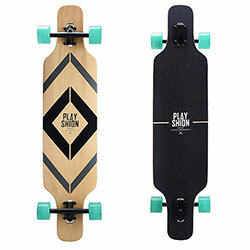 I have assembled the following best longboard for beginners in 2019 list so that anyone wanting to try this sport will be able to purchase a proper board that will serve them well. This amazing longboard is crafted from a multi-ply maple hardwood and has a bamboo deck. The multi-ply wooden surface will be stronger and capable of handling a larger amount of weight. 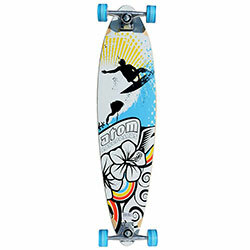 It also has ABEC 7 speed bearings, 7 inch aluminum trucks, and it is 44” in length. It is an outstanding board for beginners. It is lightweight due to the bamboo construction but it is durable and dependable do to the multiple layers of bamboo and maple hardwood used in the construction. 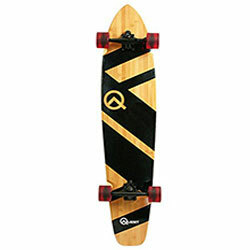 The Quest super cruiser longboard is the original bamboo longboard. They are perfect boards for beginners and pros. They are long lasting and many longboard riders say they love them because these unique boards can be customized when new and innovative changes to longboards accessories occur. 44” is a perfect length for the majority of all beginners. This board provides an excellent supportive deck, it has great control and can be accelerated to reach high speeds in a short amount of time. This is one of the best longboards for beginners. The drop through style allows the rider to be closer to the surface they are riding on so their legs do not tend to get shaky and they have more control over the board. The ground clearance is only four inches. The deck is designed with a slight concave in the center so it is easy for a beginning rider to stay properly positioned on the board with a minimum amount of effort. It is very easy to brake on this board and just as easy to build up your speed and momentum. The wheels are hard enough to allow the rider to have greater steering control, but they are soft enough that the ride is smooth and enjoyable. The weight limit on this longboard crafted from 8-ply flex hardwood is 250 pounds. This is a safe and durable board but we suggest to all beginner riders that wearing a helmet is a good idea. This board is a great choice for a beginner to ride. It is 44 inches long which falls into the perfect length range for a learning longboard. It has rugged aluminum trucks so it can take the abuses and mishaps that a beginning rider delivers. The wheels are durable and small enough to provide a good speed but large enough to keep the speed at an easily controlled amount. It has precision ABEC 7 bearings so the wheels will glide smoothly and respond to the slightest pressure from the board above. The bamboo deck has enough layers to make it sturdy and reliable, but it is not so thick that the board is heavy or slow to respond to commands. This board is a little tall but it will still be excellent for beginning riders. The kick tail increases the ability to perform tricks on the board but beginners should learn to cruise and ride freestyle before they start trying to go speeding downhill or try to execute a slide. This is a great beginner board, especially for young riders who may be shorter than the average longboard rider. Taller people do better on longer boards so this 41 inch board would be perfect for an adolescent to learn on. The unique design and shape of this board makes it respond better when making turns. You will have 9.6 inches of leverage when you make a turn with this board and you can forget worrying about wheel bite because this board design makes it obsolete. You can do all manners of longboard riding style including sliding or freeride, cruising and freestyle riding. This longboard is very easy to propel so a beginner will have no difficulties in riding or getting their board up to the cruising speed they desire. There is no assembly required. It is completely ready to ride when you get it. This is a fantastic choice for beginner riders. It is a shorter version of the longboard and is only 34 inches long. It is crafted from bamboo and multiple layers of hardwood maple so you get a beautiful board that is sturdy and will last for many years to come. It has rugged six inch aluminum trucks and 65mm wheels. It also comes with the ABEC 7 bearings so the wheels provide a smooth gliding ride, and they are capable of getting some real speed up when you are downhill riding. 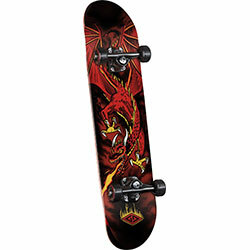 This board can be used as a freestyle or dancing board, a downhill, or to do slides and tricks with. It is small and maneuverable, and it is easy to establish complete control while riding. The lightweight design is easy to push and easy to stop. This is a learning board and because the board is versatile the beginner will be able to try out different longboard styles to determine what their preferred method of riding is. 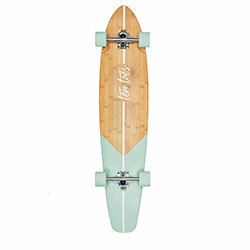 This longboard features a classic pintail design which makes it ideal for cruising. 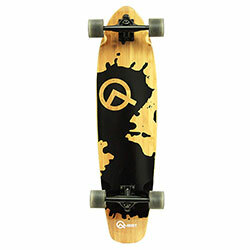 A beginner needs to learn to cruise before they can begin to learn to slide or ride their boards at high rates of speed, but when they do gain enough experience to start trying tricks and stunts the full coverage grip tape top on the pintail will help them to have control of the board and stay perfectly balanced on the board as they do difficult maneuvers. The board has ABEC 5 bearings and 78A urethane round wheels. The design and shape of the deck will eliminate any concerns of turning too sharply or having the wheels bite into the board. The deck has a concave cross section that makes it easier for a beginning rider to stay balanced on the board. This is a great board for new riders and for simple cruising purposes. This is a wonderful board for beginners. One of the reasons this board is so good for a beginning rider is the wider polymeric strap that is very strong and flexible. This strong strap reinforces the deck and if you were to somehow break the deck the strap would hold everything together until you could get to your destination. The wheels of the board are hand cast polyurethane and they roll easily so a beginner will quickly be able to propel their board. The wheels have a good enough grip that the beginner will not have as much wobbling from their board and will be able to maintain their upright position with less muscle strain. The colorful screen printed bottom makes this board appealing to the young and the young at heart. The board has a grippy top that is easier to stay in position on and it is made in China. 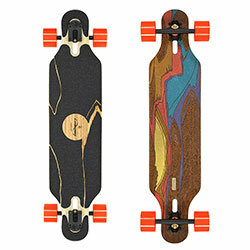 A beginner will be able to master all of the moves and skills needing for longboard riding on this piece of equipment. It has a drop through truck mount that gives a rider more stability and reduces the possibility that you will have a tumble off of the board. It is perfect to use as a commuting longboard, because it has minimum nose and tail kicks so you can master navigating the city streets, and going up and down sidewalks with ease. This also leads to being able to learn to slide and do intricate maneuvers on the longboard as your skills increase. The cork bottom on the deck dampens the vibrations caused by the road surface. The ride on this board will feel smoother and you can use it for all around riding. This is a board designed for all types of longboarding. It is lightweight and compact so it is easy to transport from one place to another, and it gains speed quickly on downhill rides. When you are just beginning to take part in an activity like longboarding you are excited and want to rush out and buy the equipment you believe that you need to pursue the activity. Before you run out and shop for a longboard set a price limit of what you can afford to spend. You can start by buying a basic board and after you have developed your skills and determined what type of longboarding you like to do the most you can then shop for a board specifically designed for that type of riding. The deck of the longboard withstands the punishment of holding your weight and absorbing the shocks of crossing rough terrain, or sliding. A beginner should always look for decks that are made of multi-ply materials. This means that several layers of the material, usually bamboo or a hardwood like maple have been assembled to give you a sturdy deck. Multi-ply decks are very hard to break. You need to consider the length of the deck you are buying. Shorter people do better on shorter decks while taller people do better on longer decks. The width of the board does not make a huge difference except, the wider boards are easier for taller people to ride on because taller people usually have longer feet and need a little more room. A drop through deck will put the rider closer to the ground surface and will help increase the amount of stability a rider has. The wheels that come on a longboard are the traditional round wheels. Shark wheels are better suited for riding if you are going to cover loose materials like sand or pebbles, or if you are going to ride through water. Smaller wheels are typically slower than the larger wheels. You also need to consider the hardness of the wheels. Harder wheels are easier to use but they also tend to develop coning and become misshapen faster. The bearings on your wheels will determine how easily your wheels turn, and if possible you should get bearings that you do not have to grease. You need sealed bearings if you will be riding in sand, dust, or through water. The trucks are the metal pieces that are positioned on the underside of your board. The truck holds your wheels and bearings in place and you want trucks that are made of aluminum so they will be lightweight and rust proof. Find the right board for the style of longboarding you intend to do, for your height, for your weight, and for your skill level. The board you have will make all the difference in how well you will be able to ride. Find your stance and do not question it. When you step onto the board you will naturally either stand with your left foot forwards and your right foot in the back if you are a person with a normal stance. If you are a person who places their right foot forward then your stance is referred to as “goofy”. To find your natural stance get on the board and stand with your feet together. Have someone push you so the board moves and your feet will naturally assume the stance that is best for you. Find your balance by placing the longboard on thick grass or thick carpet. The grass or carpet will keep the wheels from rolling so you can find your balance and avoid several falls. Stand on the board with your back foot perpendicular to the deck and angle your front foot to about a forty five degree angle. Your feet should be about shoulders width apart and you should bend your knees and lean forward a little until you feel stable and do not have the urge to step off of the board to keep from falling. Practice turning the board by placing it in grass or thick carpet. You want to roll your ankles back and forth so that your weight makes the sides of the board lift and lower on its edges. When you are riding and turning this is the motion you will need to master. Once you can do that you want to learn to shift your weight by using your toes and your heels instead of rolling your ankles. Q: Are these boards recommended for under 10 years old? Children under the age of five should not be riding a skateboard, and anyone who is under the age of ten should be closely supervised by an adult while they are riding a longboard. Children should never ride without the proper safety gear of helmet, elbow pads and knee pads. Q: Do you have replacement parts for these? You can buy replacement wheels, trucks, and bearings for your longboard. The most frequently replaced items on longboards are the wheels because the wheels will get out of shape and will no longer provide a smooth ride. Q: Is it smooth while learning longboarding? When learning to ride a longboard you should first learn to stand properly on the board, and then learn to make the board stand on its edges before you put the board on a surface where it can freely roll. It will take time before the ride is considered to be smooth. Q: Is longboarding risky for beginners? Riding a longboard is not really risky if the rider has proper balance and stance. The biggest risks to riding a longboard is falling, and falls can result in some painful injuries. Protective helmets should be worn by all beginner riders regardless of age. A longboard is an excellent source of exercise. They are fun to ride and you can learn to do some cool tricks and maneuvers while you are riding. Beginners should always practice standing on their board properly, and learning to balance on the board before they attempt to ride the board while it is in motion. When buying a longboard remember that the styles of longboarding will dictate the length of board that you buy. You should also consider your height when you are choosing a board because taller people do better riding longer boards. The best longboard for beginners is one that has a multi-ply deck. The multi-ply deck is stronger than other decks and can withstand greater weight and the force of tricks that are not executed perfectly. The main thing to remember if you are a longboard beginner is to have fun. This is a sporting activity and you should be enjoying yourself when you are doing it.